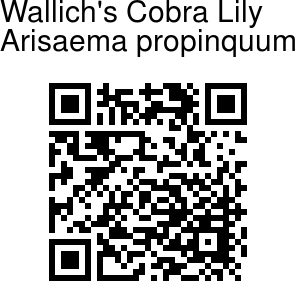 Wallich’s Cobra Lily is a species with very good resemblence to a cobra hood. The plants grows up to 30 cm tall, with 1-2 very large, trilobed, yellowish green leaves. The spathe, or the cobra hood, is dark purple oblong-ovate, prominently striped with white or purple, and a nettled pattern in the upper part, and with a narrowed tail like tip, 1-4 cm long. 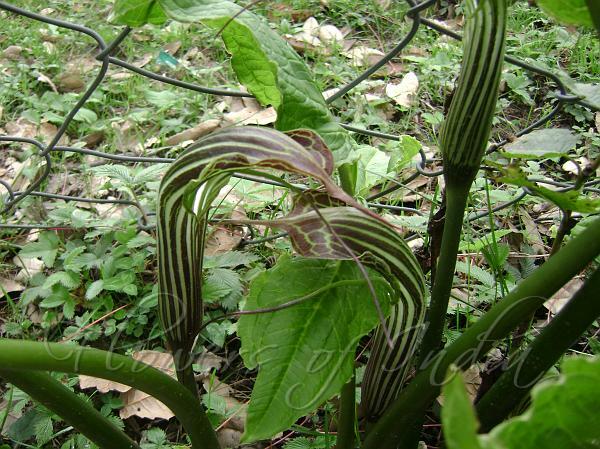 Spadix is thick at the base, with a long thread like appendage 8-20 cm long. Leaf stalk and stem are often brown-spotted. Wallich's Cobra Lily is found in the Himalayas, from Kashmir to SE Tibet, at altitudes of 2400-3600 m. Flowering: May-June.